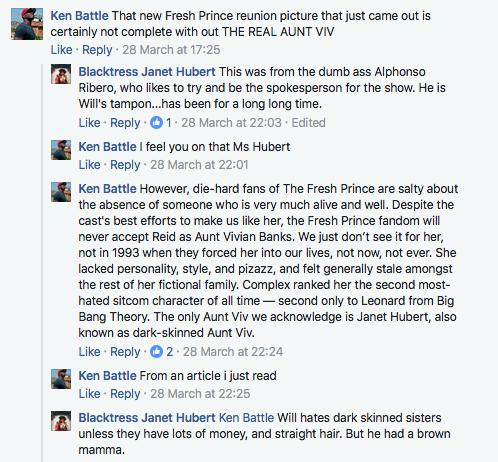 Original Aunt Viv Hits Back At Fresh Prince Reunion & Calls Alfonso Ribeiro Will Smith's "Tampon"
Janet Hubert has hit back. Janet Hubert, the original actress who played Aunt Viv in Will Smith's breakthrough sitcom 'The Fresh Prince Of Bel Air', has spoken out after the rest of the cast reunited without her. Hubert portrayed Will's aunt for the first three seasons before Daphne Maxwell Reid took up the role in the fourth, fifth and sixth, reportedly due to a long standing feud between Hubert and Smith. It seems the boat was rocked yet again this weekend after Alfonso Ribeiro, who played Viv's son Carlton on the show, posted a photo of the rest of the cast reuniting - with Hubert absent. Fans worldwide were overcome with nostalgia as the famous cast stood beaming arm-in-arm in the recent snap. Hubert, however, was less than impressed. The actress took to her politically-charged official Facebook page to slam her former cast mates, labelling Ribero in particular a "media h*e" and an "a** wipe" for Smith. "I know the media h*e Alphonso Ribero has posted his so called reunion photo," Hubert wrote above a video clip of her former character. "Folks keep telling me about it. He was always the a** wipe for Will. There will never be a true reunion of the Fresh Prince. I have no interest in seeing any of these people on that kind of level." "I am not offended in the least, by this photo… it was an event for Karen’s charity. It does however prompt me to take some meetings in Hollywood to pitch my memoir PERFECTION IS NOT A SITCOM MOM, and tell of the behind the scenes story before I leave this earth." Hubert went on to reply to one die-fan who argued that the reunion would never be the same without the "real" Aunt Viv, firing more shots at Ribero and Smith. She referred to "dumb a*s" Ribero as Will Smith's "tampon" and argued that Smith "hates dark skinned sisters". Smith, Ribero and the rest of the cast are yet to respond to the comments.